How can better design save your business $10,000 this week? You can save $10,000 / week pretty easily through better design. One of the values that clients don't always understand is that good design not only improves customer experience and drives revenue, but it also reduces time wasted on engineering the wrong product/feature/design. My solution to this is to get design involved ahead of engineering as much as possible, to inform what tech actually needs to be built. However, if you don't have design resource, you can do it yourself. 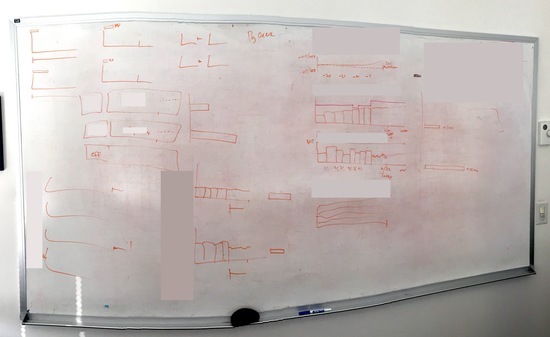 One of my clients, DellEMC, does a lot with data presentation in their products, and I did about 10 layout sketches before I committed myself to a design direction (pictured above). Myself, and one of my product manager stakeholders, designed some basic data visuals we liked (right), but the layout wasn't feeling quite kosher, and so we sketched out several different combinations before committing to a direction. In the end, my design direction went even further in a new direction, but it was informed by the final direction we chose through exploring together on the whiteboard. Doing this type of work with live UI code is nuts and a large waste of time and money. A developer making $120,000 salary a year incurs a $2,300 weekly cost in your business. If you have 4 developers involved, that's $10,000/week burn rate. So, for every week that they don't spend coding the wrong design, you're pocketing $10k and increasing the velocity of your product development. So, go forth, and sketch! Think it’s hard building an analytics product or service? Try cutting features out.